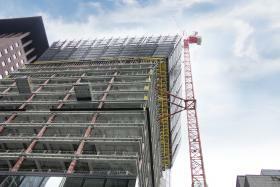 From April 11 to 17, Munich was again the centre of attention for the construction industry. About 580,000 people from 200 nations visited bauma 2016. 3,423 exhibitors from 58 countries displayed their products and abilities on the 605,000 m2 of trade fair grounds. And about 4,000 m² of that total gleamed brightly in Doka yellow. At bauma 2016, the world's biggest trade fair for the construction industry, Doka presented its new-look Doka Campus, a new trade fair concept designed to meet the criteria of customer proximity, authenticity and building-site flair. In the three theme worlds “Product”, “Project” and “Components” Doka not only addressed the needs of small and medium-sized companies, but also spoke out to big-build clients who set great store by Doka's engineering and consulting capabilities. For seven whole days Doka inspired with forming speed and quality in a new dimension and welcomed visitors from all over the world – from Canada through Chile to Africa and Australia. “bauma is definitely the industry highlight – there's nowhere else that we can present our products, solutions and services to so many existing customers and potential leads concentrated in only a few days at one place”, enthuses Jürgen Obiegli, Chairman of Executive Board Doka Group, looking back on bauma week. As one of the leading formwork companies worldwide, Doka has earned itself a trendsetter function. At bauma 2016 Doka presented several cutting-edge answers to the question about the formwork of the future. Concremote plug.IN, for example, is an innovation that will revolutionise the construction sector. Doka's framed formwork Framax Xlife plus also stirred a great deal of enthusiasm, because its form tie can be operated from one side and the technology is a superb combination of efficiency, economy and speed. The system saves up to one third in forming and strip¬ping time. The Framax Xlife plus challenge gave customers an opportunity to try out single-sided form-tie technology for themselves and demonstrate just how fast it makes them at forming. The winner gets 300 m² of the formwork system to use free of charge for 3 whole months. The Framax Xlife plus and Dokadek 30 live demonstrations were among the absolute highlights. The outdoor area at the Doka Campus proved very popular as a meeting place for people from the formwork industry. The craft demonstrations by the world champion and vice-champion from the World Skills, an international apprenticeship competition, proved to be real crowd-pullers; there was nothing else comparable to be seen anywhere at the trade fair. Four times every day on the Doka Campus they worked against the clock and every day they smashed their own records – 25 m² of Frami were formed in the record time of 7 minutes, 45.22 seconds. That's build progress at the rate of 0.016 h/m². With its presence at bauma 2016 the formwork experts proved once more that Doka is the top player in the formwork industry. Regardless of size and complexity of the construction project, Doka delivers a precisely fitting formwork solution for any requirements. Thank you for your interest - Doka Campus – crowd-puller at bauma 2016. Thank you very much for your interest - Doka Campus – crowd-puller at bauma 2016.